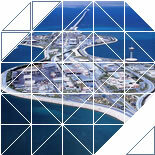 Al Jazair is a central point for growth in the tourism sector of Bahrain. It is one of the very few beachfront properties left in Bahrain, which is surrounded by many sightseeing locations. Al Jazair is a fantastic offer for investors and developers to a world-class entertainment enterprise.